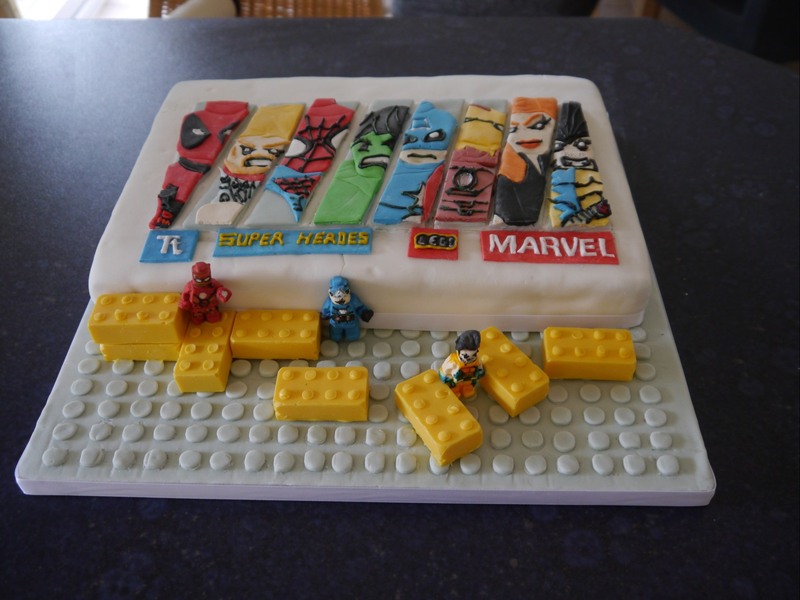 Welcome to the final part of my Lego Superheroes cake tutorial. 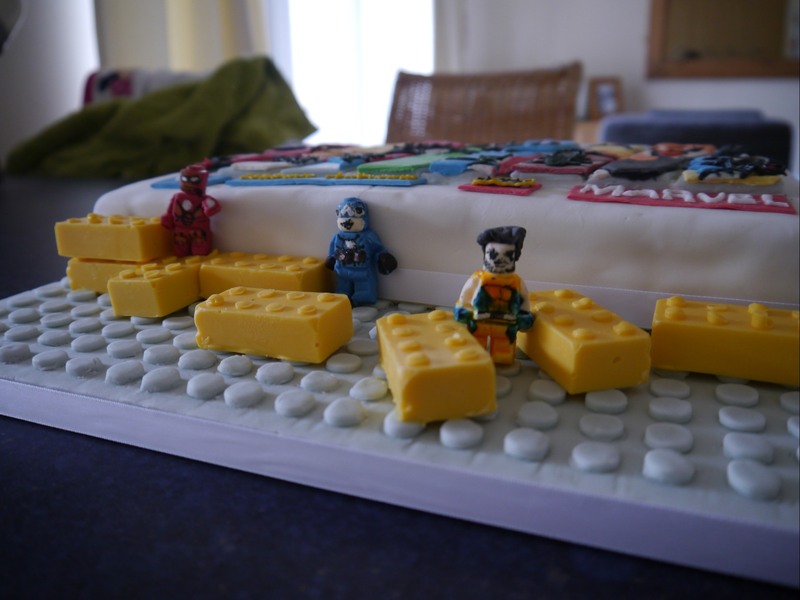 In Part 1 and Part 2 I ran through how to level and cover a cake with fondant, and how to create superhero pictures using a pin (i’m like Macgyver). 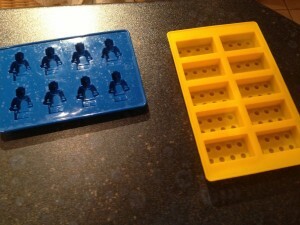 This post is about how I made the Lego bricks and Minifigures at the front of the board. To make the bricks and figures I used moulds bought from The Gift Oasis via Amazon, I was very impressed with their customer service as they were out of stock when I ordered but rather than just waiting until the stock came in they contacted me to ask when I needed the items for, if I would like an alternative product or a refund? I chose to wait and the moulds arrived the next week. Initially I was going to use floral paste coloured yellow to make the bricks but after a couple of unsatisfactory attempts I was inspired by the Angel Eden Blog who used the same moulds as me to use my Wilton candy melts instead. I first used them at valentines and wrote about it in my first ever blog post, more recently I used them to make lollies for my daughter’s birthday. They are super easy to use and taste like most white chocolate. I melted the yellow candymelts in a microwavable bowl using 15 second bursts and stirring in between each one. Once most of the candymelts had melted I continued to stir and allowed the heat from the bowl to melt the rest I poured the candymelts into the mould and wiped away any overflow to give clean lines. I then popped the mould into the fridge to set – the instructions actually say not to set in a fridge but I’ve never had any problems and in the heat lately I didn’t really have much option. Once set I popped out lovely shiny lego bricks ready to use on the board. 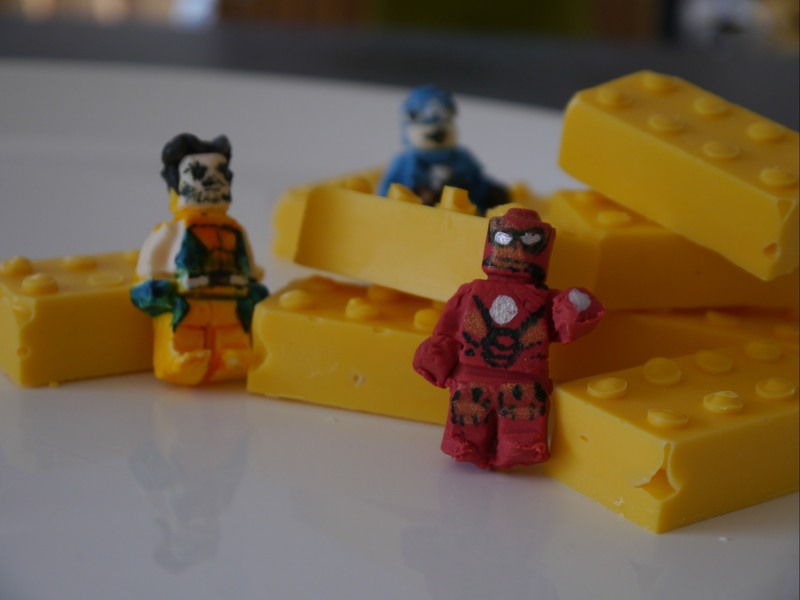 The minifigures are made from coloured flower paste. I made several figures in Blue, Red and skin coloured. I pushed the paste into the mould and then, because I needed to remove them from the mould but still be able to manipulate them afterwards, I froze them. I removed the frozen figures in one piece and allowed them to defrost before using a sharp knife to separate the arms and legs from the bodies in order to pose the figures. Once I was happy with the positions I used a fine paint brush, cocktail sticks and gel colours to add detail to the figures. For Captain America’s face I also dissected a skin tone figure to get the bottom half of a face and cut out the equivalent section of the blue figure. I then used edible glue to insert the skin toned bottom half of the face. I was very happy with them, ok they may not have been perfect but from a distance they looked ace and I think it was obvious which characters they were which was all I really wanted. As I did with the main cake I used pearlescant colour for Iron Man’s power source and eyes. and it was perfect for the job. Once I had arranged the bricks on the board I decided where to place the figures. Captain America was simply stuck to the side of the cake with edible glue. For Iron man I used the blow torch to melt the top of the brick he would stand on and pushed his feet into it. Wolverine I stood between two bricks and melted them slickly where his hands touched them. That’s it then, I hope you enjoyed my first try at a decorating tutorial. The cake was a big hit at the BBQ it was made for and as an amateur I was very happy with it. This entry was posted in Large cakes and tagged Candy lego bricks, Edible lego minifigures, Lego Bricks, Lego cake, Lego Minifigures, Lego superheroes. Hey! Thanks for mentioning our store and I’m just so glad we created an impression! It’s what keeps us going.